Some people watch birds. Others watch dragonflies. For amateur odonatologists, as dragonfly enthusiasts are called, the summer and fall bring a bonanza. In California, they might spot a pair of bright-red flame skimmers flying around, attached to each other in a mating dance. Or a blue female damselfly, wings held tightly alongside her torso, dipping the tip of her abdomen beneath a water clover to lay her eggs. What most amateur odonatologists have probably never seen is what happens after those eggs hatch underwater. It’s a surprisingly scary sight. If adult dragonflies are known to be precise hunters, capable of turning on a dime and using their almost-360-degree vision to nab mosquitoes and flies in midair, their dragon-looking babies are even more fearsome. And they do it without the benefit of wings. Instead, they have a mouthpart that they shoot out. It’s like a long, hinged arm that they keep folded under their head and it’s eerily similar to the snapping tongue-like protuberance the monster shoots out in the "Alien" sci-fi movies. Dragonfly and damselfly babies, also known as larvae or nymphs, spend months or years underwater growing to a couple of inches long and developing wings on their backs. As it turns out, dragonflies spend most of their lives as aquatic insects crawling around the bottom of ponds or streams. Unlike butterflies, which also have distinct life stages, dragonflies’ transformation into adults doesn’t require a period of dormancy during which a pupa lives off the protein it stored as a caterpillar. 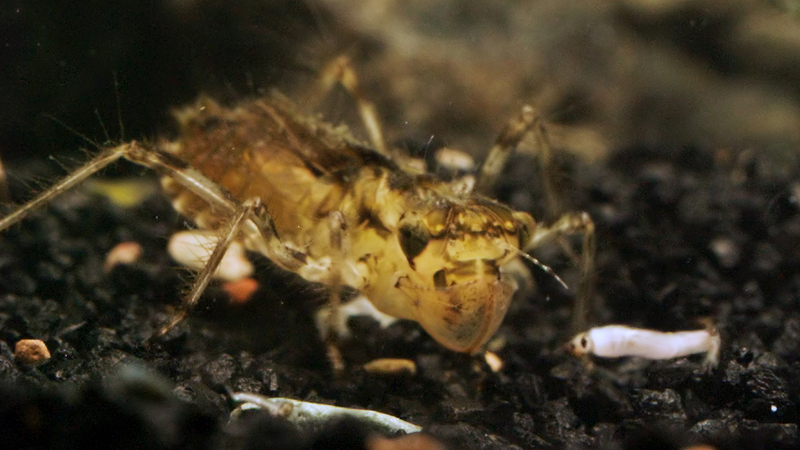 Instead, dragonfly nymphs have to fend for themselves to keep up their carnivorous diet. A nymph’s eyesight is almost as precise as an adult dragonfly’s and when they spot something they want to eat, they extrude this mouthpart, called a labium, to engulf, grab, or impale their next meal and draw it back to their mouth. Only dragonfly and damselfly nymphs have this special mouthpart. “It’s like a built-in spear gun,” said Kathy Biggs, the author of guides to the dragonflies of California and the Greater Southwest. With their labium, nymphs can catch mosquito larvae, worms and even small fish and tadpoles. 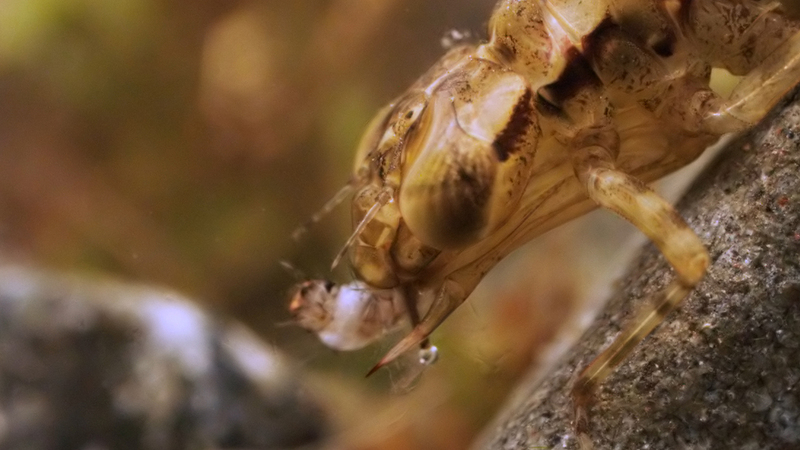 “It’s obviously an adaptation to be a predator underwater, where it’s not easy to trap things,” said Dennis Paulson, a dragonfly biologist retired from the University of Puget Sound. 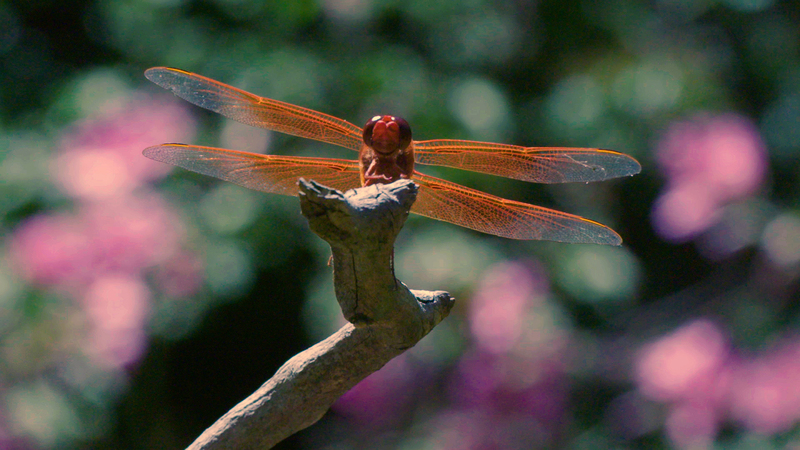 Dragonflies have been around for 320 million years, since before the dinosaurs. Sometime many millions of years ago, the different mouthparts that insects use to catch and push food into their mouths fused to form the labium, said Paulson. Also known among biologists as a “killer lip,” the labium comes in two shapes. In nymphs that will grow up to be skimmer dragonflies, the labium is shaped something like a spork. Skimmer nymphs bury in the sand and wait for their prey. When the time is right, they shoot out their killer lip and scoop up their prey or trap it between two serrated halves. A nymph is full of a blood-like fluid called hemolymph, which it controls by hydraulic pressure to propel the labium. “Then it relaxes, and the muscles pull it back to the head,” said Paulson. After use, the spoon-shaped labium rests on a skimmer’s face like the mask that the cannibalistic psychopath Hannibal Lecter was made to wear in prison in "The Silence of the Lambs." Imagine Lecter shooting that mask out to grab a snack and you’ll have a picture of what a skimmer nymph’s labium looks like in action. Nymphs that will grow up to be darner dragonflies have an extra surprise on their labium, a pair of pincers right at the end that they use to grab or impale insects they’ve stalked among aquatic plants. The nymph’s pincers are now serving as a fork to push the food in. “You have the knife, fork and plate all in the same structure,” said biologist Vincent Resh, who studies aquatic insects at the University of California, Berkeley. When the meal is over, the labium folds up neatly, ready for the next occasion.